Time sure flies when you’ve been having fun hiking around. Hard to believe six years had already passed since our first visit on this mountain. That time pups and I approached from Thorp Creek described in some report, but later found out there was another approach via Knox Creek, which was how we went up this time. After spending two Sundays hiking in Central Washington to avoid rain in the Cascades, we were more than ready to get back in the mountains. Forecast east of Snoqualmie Pass looked a lot better, so we paid the mountain a second visit. French Cabin Creek Road (#4308) was mostly snow free until a quarter mile before the junction with Knox Creek Road (#120). When more snow showed up on the road, in fear of getting high-centered, I parked by the last road switchback before trailhead at 4,120′ and walked a quarter mile to starting point and put on snowshoes. It looked as if no one had been here since recent snowfalls, so pups (ahem) and I took turns breaking trail. Only two to three inches of snow in the beginning going up the switchbacks, but more of it the higher we went. Toughest section to get through was at head of basin where trail contoured the basin counterclockwise before reaching the pass. Snow got knee deep in that section so we were all postholing like crazy. It started to get windy then. From the pass to lowest point (5,200′) of Thorp Mountain’s southeast ridge had less snow, so we were able to move faster, plus we were going downhill. When more snow appeared just as the elevation started to increase again, we began to polehole and moved slower than before. 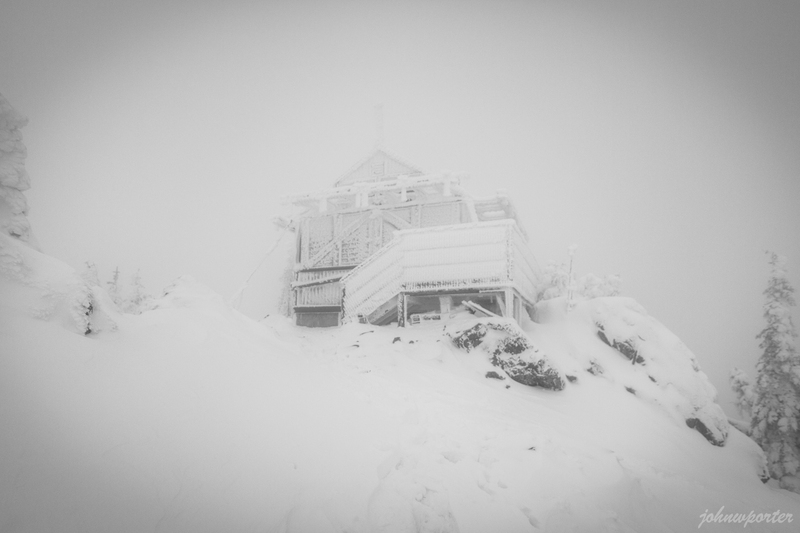 Views, if any, were minimal in late afternoon, and when we got to around 5,600′ we were in a complete whiteout. Carefully we attained the ridge crest, and step by step made our way uphill in headwind. I periodically looked for the tower, but couldn’t really see anything beyond 30 feet. But then, bam, all of a sudden like a ghost the tower appeared out of nowhere. We took refuge north side of the tower to get out of the wind, and spent just enough time to eat and take some photos before heading back down.